Medion's Akoya E6232 (MD 99222) will be available to from Aldi stores on 27 April, and it's good for the price you pay. 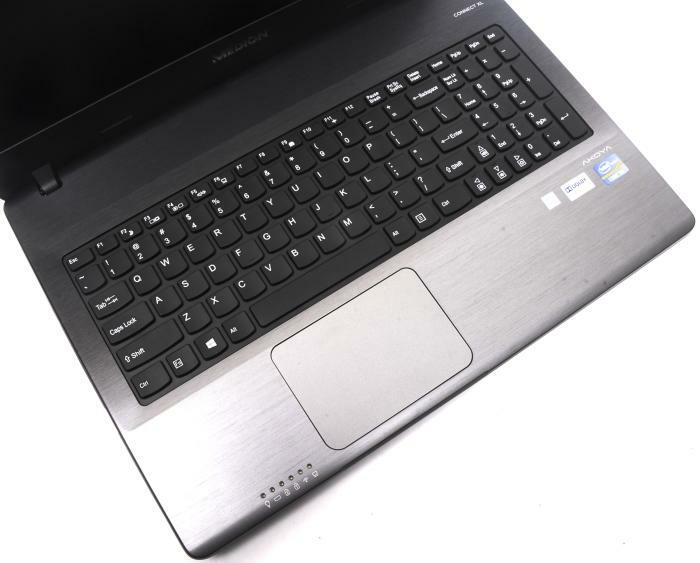 Its Core i3 CPU gives it good performance, it has useful ports along the sides, and its keyboard and touchpad are comfortable to use. Here's what you need to know about the Medion Akoya E6232 (MD 99222): it's a cheap, 15.6in laptop with an Intel Core i3 CPU, 4GB of RAM and a 500GB hard drive that will go on sale at Aldi supermarkets on Saturday, 27 April. It should be considered as more of a stay-at-home machine, rather than a mobile unit that can be carried on a daily basis, mainly because of its weight, size and build quality, but don't get us wrong, it's still pretty good considering its $499 price tag. The configuration of Medion's latest Akoya is comprised of an Intel Core i3-3120M CPU (it has two cores, Hyper-Threading, Intel HD 4000 graphics, and runs at 2.5GHz), 4GB of DDR3 SDRAM and a 500GB hard drive. It's a machine that's suitable for office work, typical Web browsing and communication tasks, and it can even be used for a bit of music and video encoding. In our tests, it performed as well as we expected. The Blender 3D rendering test took 48sec to complete, while the iTunes MP3 encoding test took 59sec. To put this in perspective, the Dell Inspiron 17R, which is a $1099, 17in notebook with a Core i5-3337U CPU, was 2sec faster in Blender and equal in iTunes. The Medion's CPU power is definitely quite good for what you pay. In addition, we ran some video encoding tasks: Handbrake took 25min 16sec to convert a DVD file to an MP4 file, while Arcsoft MediaConverter 7 took 14min 35sec to turn that same DVD file into a more space-saving MKV file. These times are only a couple of minutes off what the Dell took to complete the same tasks with its more powerful Core i5 CPU. If you're interested in using this laptop for games, its integrated Intel HD 4000 graphics won't be able to handle much except for older, low-resolution and low-detail games. This is indicated by its score of 4062 in 3DMark06. However, you can use it to play many games downloaded through the Windows Store. We used it for a lot of card- and puzzle-based games, as well as the Riptide GP racing game, and some platform games such as Agent P Strikes Back. Storage is basic in this notebook, which isn't surprising for this price range. Its 5400rpm hard drive has a capacity of 500GB (and a formatted capacity of 464GB including the recovery partition — you do also get a recovery DVD though) and it's quite slow. It recorded 26.5 megabytes per second (MBps) in our file transfer tests, while in CrystalDiskMark it ended up with a read rate of 97.54MBps and a write rate of 93.68MBps. It ended up being a little faster at writing data than the 1TB drive in the Dell Inspiron 17R, but during everyday usage, the Medion felt a little sluggish when we tried to access settings or launch programs. It's a laptop that's hard to upgrade; it doesn't have an access panel or side-slot for its hard drive, so you'll have to almost pull the whole thing apart to the get to the drive bay. If you plan on upgrading the hard drive in the future, you'll have to spend some time figuring out how to pull the unit apart. It doesn't have an access panel, and the hard drive is located under the right palm rest. 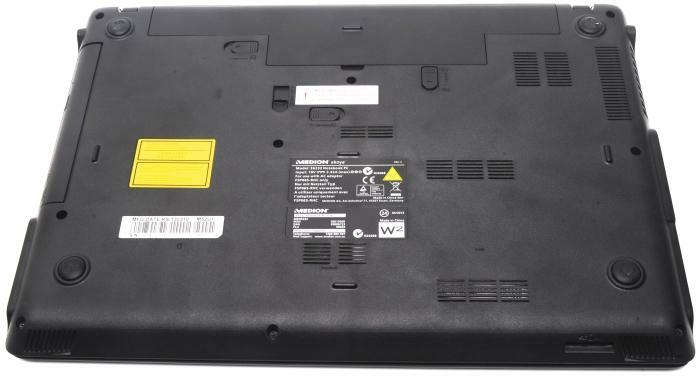 One impressive feature of this relatively large laptop is its battery, which has a 55 Watt-hour rating. It lasted 4hr 54min in our rundown test, in which we disable power management, enable Wi-Fi, maximise screen brightness and loop an Xvid-encoded video. It's a good showing for a 15.6in laptop that doesn't have an ultra-low voltage CPU, and you can get a bit more out of it if you lower the brightness and enable a balanced power profile (depending on what tasks you're performing). It's a notebook that doesn't get noticeably warm thanks to its large base and active cooling (it has a footprint of approximately 380x265mm and a height of 25mm), and it doesn't make much noise. You can use it on your lap if you dare, but at 2.5kg, it's a little on the heavy side. By the same token, it's probably not a notebook that you would want to carry on an everyday basis; we think it's better suited as a stay-at-home type of computer, rather than as a mobile unit, even though its battery life is good. The build quality is a little creaky, which is expected of a laptop in the sub-$500 realm, and there are a couple of design choices that can get annoying the more you use this notebook. The first is the location of the power connector, which is in the centre of the left side, rather than at the back, and this can get in the way. The second is the location of the status lights at the top of the left palm rest. These status LEDs are bright and can they become tiring to look at when using the notebook at night. If we owned this notebook, we would dull them with a marker, or put some electrical tape over them. Here are the status lights we're complaining about. Another thing to expect is an LCD screen that's only just adequate. It has a resolution of 1366x768, which is fine, and it's a matte screen, which is great, but it has narrow vertical viewing angles and its picture just looks too pale overall. We spent a lot of time adjusting the tilt in order to view details and colours in photos. You could always plug in an external screen; the left side has both a VGA output for an older monitor or TV, and an HDMI output. The left side has the vent, power connector, VGA, Gigabit Ethernet, HDMI, and two USB 3.0 ports. As far as the rest of the notebook's features are concerned, they're pretty good. In addition to the video ports we just mentioned, you also get two USB 2.0 ports, two USB 3.0-capable ports, a DVD burner, an SD card slot, Gigabit Ethernet, separate headphone and microphone ports, and speakers (that are okay for basic YouTube viewing, for example). You also get a webcam and built-in 802.11n Wi-Fi and Bluetooth 4.0. The right has the audio ports, two USB 2.0 ports, the DVD burner and the power button. The SD card and speakers are on the front. It's a fairly comfortable unit to use for long periods of time when it's resting on a desk. Its palm rest is large (92mm), its keyboard is full (it includes a number pad), and it has a touchpad that's large (101x70mm), accurate and supportive of Windows 8 swipe-in gestures. We liked typing on this notebook, mainly because its keys have lots of travel and feel crisp to hit. The lack of spacing around the arrow keys, and the lack of separation between the main part of the keyboard and the number pad can take some getting used to, and there is a short right-shift key that could be uncomfortable for some typists. 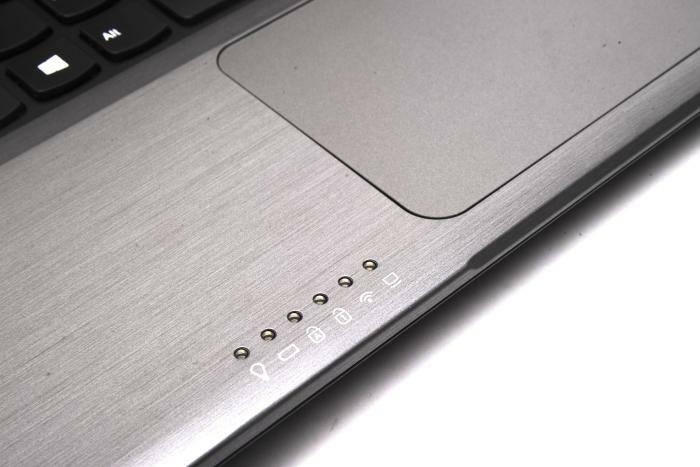 The touchpad felt a little sticky the first time we used it, but it got smoother as our tests wore on. The Windows 8 swipe-in gestures were a little too easy to accidentally invoke, but this is something we're seeing in many other laptops, too. The keyboard is comfortable to type on and the touchpad felt smooth and responsive. As with most of the other notebooks Medion has released through Aldi, this one represents good value for money and we think it's worth trying to pick one up when they go on sale on Saturday, 27 April. The speed you get is suitable for lots of home-based computing tasks, and the features are good enough to allow for extra peripherals to be plugged in around the notebook. The screen isn't great, the hard drive is slow and the overall design could be better, but for the $499 price tag, some comprises such as these should be expected.